With 13,000+ sleeping rooms, Greater Des Moines offers hotels and bed and breakfasts with top-notch amenities to make for a restful night during your stay. Whether you’re staying downtown or making a short trip from one of our surrounding areas, you’re sure to have a comfortable experience. This all-suites downtown Des Moines hotel has the privilege of being the closest hotel to the Iowa State Capitol campus. Our hotel is ideally situated among the trendy eateries and shopping of the Historic East Village, and the nightlife of the Court Avenue Entertainment District. Enjoy the spacious, modern Des Moines lodging provided by 234 two-room suites with amenities such as two 37-inch LCD HDTVs, WiFi and internet access, and local photography and artwork adorning the suite walls. Step into true Des Moines hospitality with the beautiful open atrium lobby. Take advantage of great on-site services such as an indoor pool and a modern fitness center. All guests at our downtown hotel in Des Moines, IA wake up to a complimentary cooked-to-order breakfast with a variety of options to choose from. Liberty's - an Iowa Grill, offers great American food in a relaxed environment. 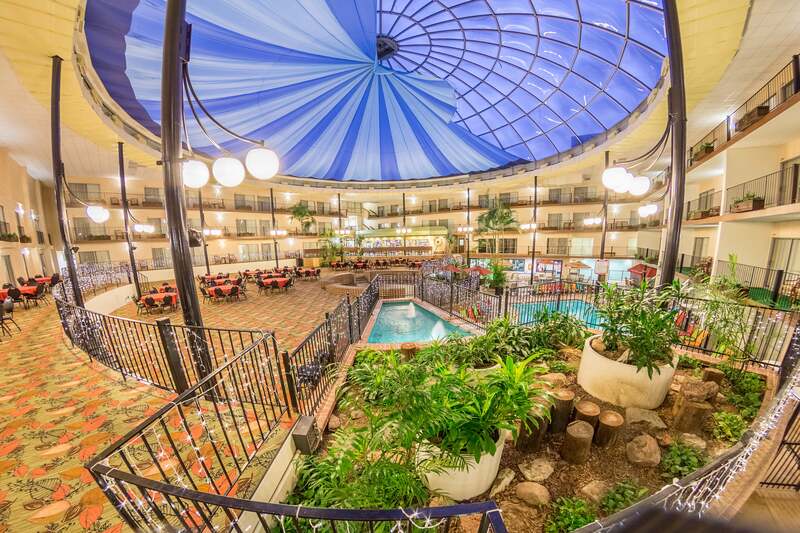 When you return to this Des Moines hotel after your day, the complimentary Evening Reception* offers refreshing beverages and warm conversation. 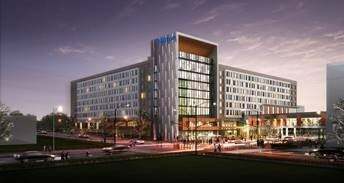 Hilton Des Moines Downtown is a bright and modern hotel in step with the tech-centric area. 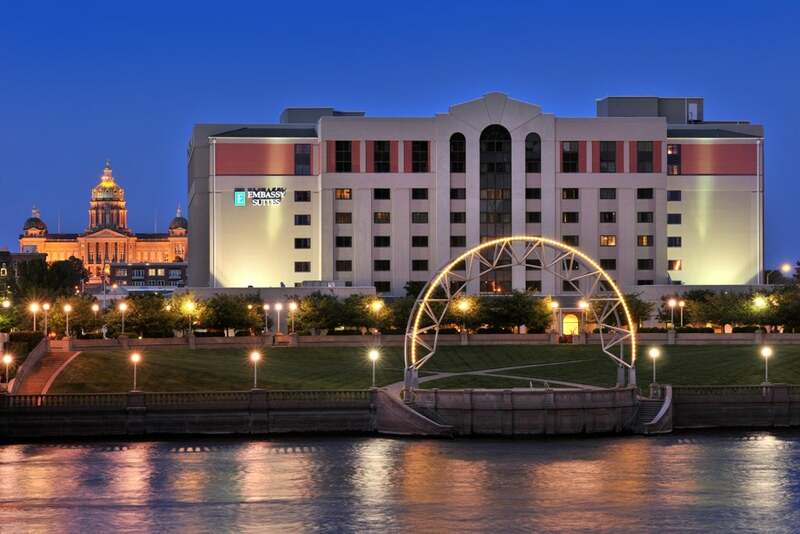 The hotel is connected to the Iowa Events Center via the Des Moines skywalk system and offers quick access to offices, local dining and Des Moines attractions. Our guestrooms are spacious and comfortable with refrigerators, laptop safes and USB charging ports. We have plenty of conveniences for your stay, including Park Street Kitchen and Bar, indoor pool, fitness center, and Technology Lounge. Stay at the Holiday Inn Airport, just a 10 minute drive from Wells Fargo Arena. Speakeasy: A refuge for those in search of a good time, the Speakeasy is outfitted with TVs, Touch Tunes Music, pool tables, Golden Tee golf, darts, and Silver Strike bowling. Lobby Bar: A gourmet coffee bar on one side and a full bar stocked with premium liquor and your favorite pints on the other. Grill: Serves homestyle American classics for breakfast, lunch and dinner. Book our Signature Concert Package which includes free transportation to and from your concert, free cook to order breakfast, and two free drink tickets for our Lobby Bar/Speakeasy. Packages start at $149. 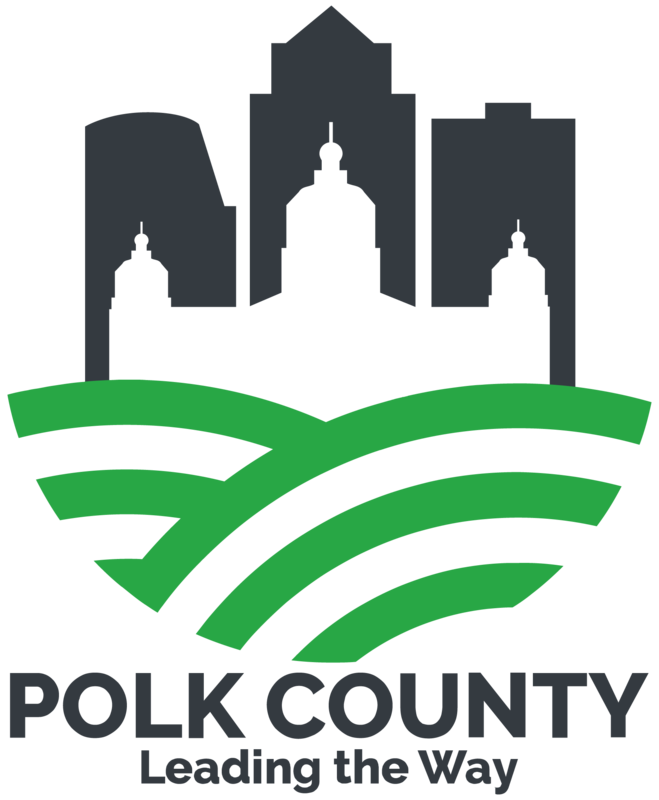 13,000+ rooms in Greater Des Moines. Hotels. Bed and breakfasts. Choice amenities. Locations with indoor water parks. Catch the “suite” spot for your next stay in the Metro. Marriott hotels. Hyatt Place. Hilton hotels. And more. A hotel lobby to make you swoon. Complimentary breakfast or a whirlpool suite. There’s something for everyone. Round out your days in Greater Des Moines with a restful night. Catch the perfect property. Hotels with fitness rooms. Some feature their own on-site restaurants. And one even shares walls with a bit of casino action. Stay downtown or travel the short distance from one of our surrounding communities. Des Moines hotels are top-notch room service. And comfortable beds to lay your head.